Yamadera (山寺) is located in eastern mountains of Yamagata Prefecture. 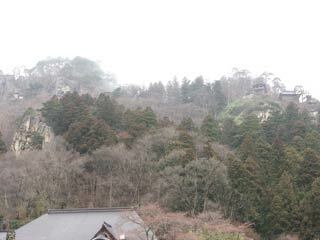 It is famous historic site with the mountain temples. Risshakuji Temple, also known as, Yamadera is one of the oldest temples in Japan. Temples are placed on the cliffside and the view from the bottom of the mountain are so unique and mysterious. It has great harmony of history and nature. Many gift shops and restaurants are around the station and the temple. Risshakuji Temple, also known as Yamadera, the mountain temple, is one of the popular travel spots in Yamagata. It was built in 860 by Jigaku Daishi. It is famous for the temple of breaking bad luck, and many people visit here to pray for their good luck. It is very unique temples because most of temples are located on the edge of hard cliffs, and have great views of a valley. The Hiku Master, Matsuo Basho had visited here and wrote his poem. ... is shopping district with nice restaurant. You can see Risshakuji Temples from here. There is the museum of Matsuo Basho.